The "cancer within our society of radical Islam" needs to be "cut out", UKIP leader Paul Nuttall has said. It was time for UK Muslims "to step up to the plate" after the attack in London that claimed the lives of four people, he said. Prime Minister Theresa May said earlier it was wrong to call the attack Islamic, it was "Islamist terrorism - it is a perversion of a great faith". The Greens' Jonathan Bartley called Mr Nuttall's comments "abhorrent". Describing the atrocity as "an appalling act of terrorism", Mr Nuttall said it was no coincidence it had taken place a year after suicide bomb attacks on the Brussels airport and underground system, which killed 32 people. He said the attack had been a matter of "when not if". "As long as we have this cancer within our society of radical Islam it will always happen - it will happen again - it needs to be sorted out," Mr Nuttall said. "It's not that easy, but we need to ensure the Muslim community itself, who in many cases will know who these people are living among them, they need to stand up to the plate and they need to report these people to the police as soon as possible." 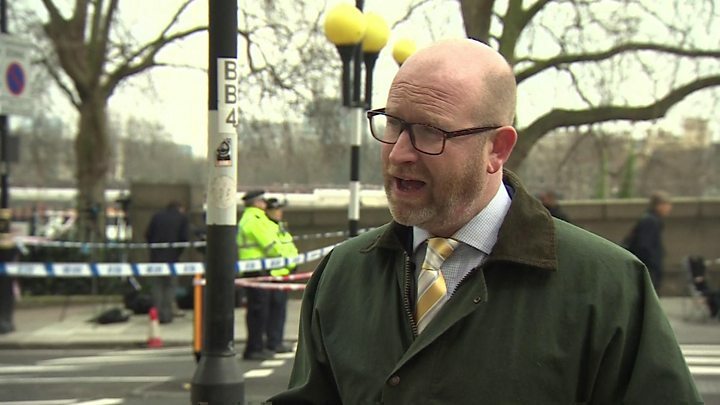 Mr Nuttall called for cuts to police numbers to be reversed as "we're living in a dangerous world". "It wasn't as if the guy had a machine gun or anything like that - it was pretty basic, and I think maybe security does need to be improved," he said. But Omer El-Hamdoon, deputy secretary general of the Muslim Council of Britain, called for an end to what he described as the cycle of blaming Muslims every time there was a terrorist attack, saying the situation "should not be allowed to scare us, to disrupt us or divide us". "At the end of the day, Muslims are just as much victims of terrorism as anybody else," he said. "As Muslims, we're part of British society, and we do condemn this attack and we make sure we do say that very clearly." Green Party co-leader Jonathan Bartley said: "Every time you think UKIP can't sink any lower, they do. "It is abhorrent that Paul Nuttall is trying to capitalise on this terrible tragedy to create division between communities. "Just a brief look around him would have revealed to Nuttall a resilient multicultural society coming together to reject violence."